At Bryan Municipal Utilities, we know that uninterrupted electric service is important to all of our customers. But for those whose medical conditions require the use of life-sustaining equipment, we’ve taken reliability a step further by establishing the Medical Certification Program. What Does The Medical Certification Program Provide? 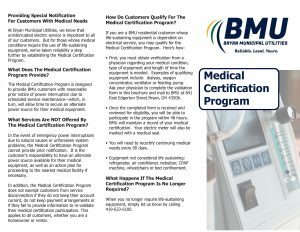 The Medical Certification Program is designed to provide BMU customers with reasonable prior notice of power interruption due to scheduled service maintenance—which, in turn, will allow time to secure an alternate power source for their medical equipment. What Services Are NOT Offered By The Medical Certification Program? In the event of emergency power interruptions due to natural causes or unforeseen system problems, the Medical Certification Program cannot provide prior notification. It is the customer’s responsibility to have an alternate power source available for their medical equipment, as well as an action plan for proceeding to the nearest medical facility if necessary. In addition, the Medical Certification Program does not exempt customers from service disconnection if they do not keep their account current, do not keep payment arrangements or if they fail to provide information to re-validate their medical certification participation. This applies to all customers, whether you are a homeowner or renter. How Do Customers Qualify For The Medical Certification Program? First, you must obtain verification from a physician regarding your medical condition, type of equipment and length of time the equipment is needed. Examples of qualifying equipment include: dialysis, oxygen concentrator, ventilator or feeding pump. 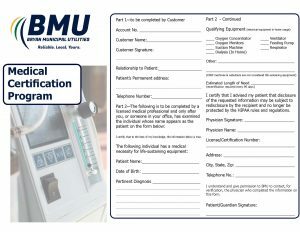 Ask your physician to complete the validation form in this brochure and mail to BMU at 841 East Edgerton Street Bryan, OH 43506. Once the completed form is received and reviewed for eligibility, you will be able to participate in the program within 48 hours. BMU will maintain a record of your medical certification. Your electric meter will also be marked with a medical seal. You will need to recertify continuing medical needs every 90 days. Equipment not considered life sustaining: refrigerator, air conditioner, nebulizer, CPAP machine, wheelchairs or bed confinement. What Happens If The Medical Certification Program Is No Longer Required? When you no longer require life-sustaining equipment, simply let us know by calling 419-633-6100. When disconnection of electric service presents a danger or health hazard for a qualifying resident, certification by a medical professional to maintain electric service can be provided up to (3) three times in any 12-month period. Medical Certification forms must be completed and submitted in writing for each case of pending service disconnection and are each valid for 30 days. It is the customer’s responsibility to submit a completed application for a new medical certificate, if the need continues. Medical certification does not exempt customers from service disconnection if they fail to comply with payment plan arrangements or if they fail to provide an approved medical certification. This applies to all customers, whether you are a homeowner or renter. If you experience financial difficulties paying your utility bill please contact the Bryan City Clerk-Treasurer’s Office, at 1399 East High Street, for a list of agencies that may be able to provide financial assistance.